Rods by Imperial Baits - the perfect mixture! We present the perfect carbon trio that I, the Imperial Baits team and some of our customers love to fish with so much! We offer something for specialists! In the NEWS of Carp-GPS we have always informed about the individual development steps. 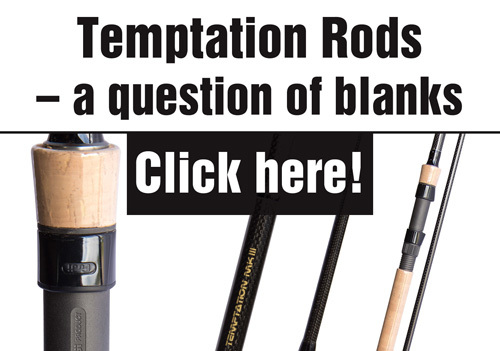 The rods were created by ideas that can only get into your head while you are fishing. Projects developed from this became a concept of the Temptation series, which has now been available for sale in the 3rd generation since 2001. The Temptations are not off-the-pegrods and are rarely found in fishing shops due to our direct marketing. You can be sure to own something special! Quality and price/performance of the temptations look for the same, so also the active bow when the "bull" is under the boat. Total Control, that was and is our goal! - pure "max nollert" Carbonblanks, detailed information about blank production - clickhere! - Rambo Slim real seat with super firm seat, also suitable for extra large rolls! - We take the costs of redemption.